I am super excited about this recipe. Remember my Homemade Cheddar Cheese Crackers recipe? I wanted to try a gluten free version, and after many experiments with gluten free options, I found almond flour to work best. I didn’t need to use salt or butter this time, my crackers came out perfect with only 2 ingredients: almond flour and cheese. 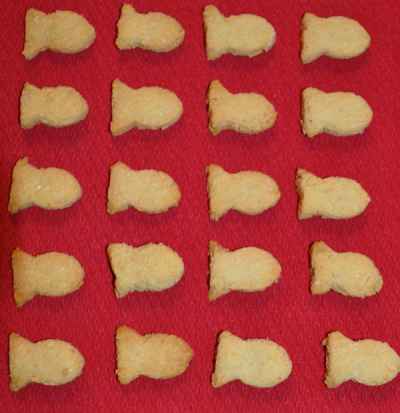 For this Homemade Gluten Free Goldfish Crackers I am only using 2 Healthy Ingredients. Yes, only 2 ingredients and you have perfect, super delicious crackers. I can’t describe the wonderful texture, the smell of the crackers coming out of the oven, and the “cheesy” yummy taste. Simply amazing! For adults, I recommend trying these crackers with a glass a wine. The crackers are incredibly good! If you are interested in more simple 2 ingredient recipes, please see my Strawberry Applesauce and Applesauce With Cinammon recipes. You can have the most delicious and healthy snack ready in less than 10 minutes! It’s all about simple recipes made with healthy ingredients. You can make these crackers in less than 30 minutes. All you need is a Fish Cookie Cutter (or use other fun cutters like heart cutter for Valentine’s Day), Almond Meal Flour, and a good quality hard cheese (gouda or parmesan works great). Make sure you use quality ingredients: organic almond flour, and cheese. Ingredients you simply won’t find in commercial crackers. A Food Processor or blender is also needed to mix the ingredients. 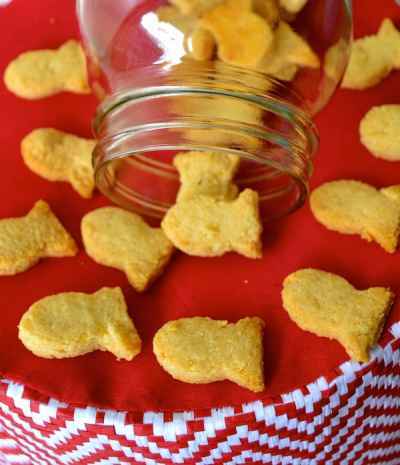 I used my Vitamix These Homemade Gluten Free Goldfish Crackers are so easy to make and you can also make double the recipe and freeze for later. My DIY Homemade Gluten Free Goldfish crackers recipe was a success. Try it. You won’t be disappointed…..I promise.